I bet it is hard to find a higher leg density than in a freshly born ball of spiderlings. These 30 or so Pholcus phalangioides spiderlings hatched last night on the ceiling of my outside toilet, about 240 legs in just a few cubic millimeters. 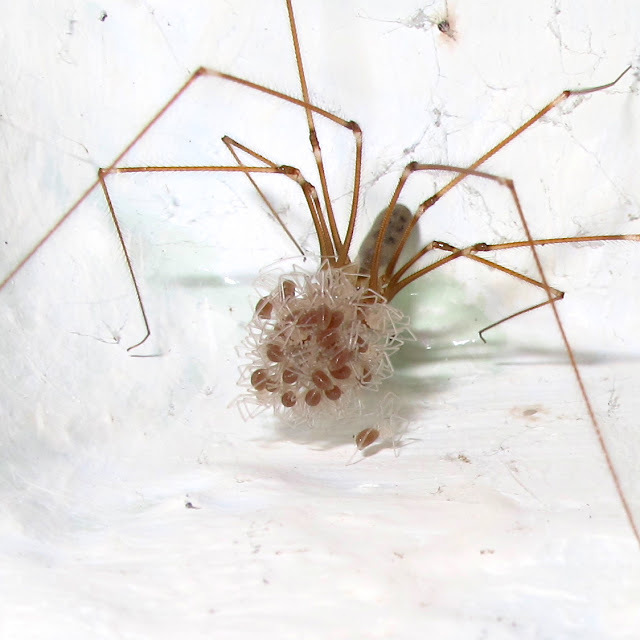 In the morning they were still clutching each other and their empty egg sac. By today's afternoon, they had arranged themselves under the vigilant eye of mum as in my previous post. That's a wonderful picture! I've seen them carrying the eggs around but never the youngsters, like this. Brilliant! Yup, I agree, a real cracker of a photograph! Thank you Phil and Ray, a lovely feature of Pholcus is how nicely they pose for you, not running away like other critters!